Born in Mexico City on June 16, 1920 to a legacy of important politicians from Guadalajara, Jalisco. He earned a law degree from the Universidad de Santiago in Chile and an advanced law degree from the Universidad Nacional Autonoma de Mexico where he also held a professorship from 1947 to 1958. 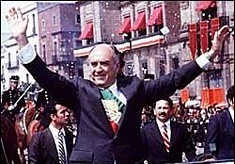 Lopez Portillo was president of Mexico from 1976 to 1982. An accomplished artist, López Portillo also produced many paintings and hundreds of illustrations for several publications including several books that he authored himself. He died on February 17, 2004 after complications due to pneumonia.